Compared to the way things once were, the number of elements you have to juggle when creating a game have hugely increased. It’s for this reason that games have developed so much, while at the same time you’re left with the feeling that they have also lost something they once had. Yes, I can see that. You could say they’re missing that artisanal aspect, that craftsmanship. You can’t compete in today’s market if you’re relying on craftsmanship alone. You need to somehow combine it successfully with modern industrial processes. It could be that the ‘spirit’ that inspired that craftsmanship has grown weaker. To what degree that spirit of craftsmanship that the pioneers of game development possessed has been passed on to the younger generation, I wonder. In the past, there was a lot of scope to influence things with your own efforts, so the people who made games had a grasp of all aspects of game creation. This meant that they developed a natural ability to judge what was important, as well as the determination and tenacity to achieve it. I think that’s the true meaning of craftsmanship. But as the method of creating games has changed, the amount that one person can do has shrunk, and a barrier has appeared between the way developers once thought and the way the new generation approach game creation. Now I’d say it’s really important for those who’ve been involved in game creation for a long time to play the role so that the younger generation put their faith in what their senior developers are doing. This is true. Simply because you’ve been involved in games for years doesn’t necessarily mean your technical skills are superb. But I think what you do have is determination and tenacity. That can become the glue that binds a team together, and when you combine that with the technical skills of the younger members, games themselves will change. I really felt that The Last Story and Xenoblade Chronicles8 took shape thanks to that kind of determination. 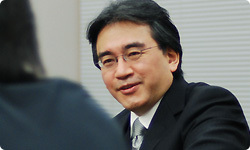 We at Nintendo were right there with you in order to see those games through to the end. 8Xenoblade Chronicles is an RPG released on Wii in Japan in June 2010 and in Europe in August 2011. 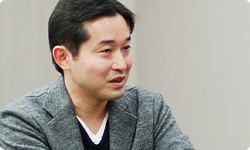 Tetsuya Takahashi was the overall director on the project. Now that you mention it, the release date for both titles was delayed, wasn’t it? Something I’ve felt recently is that a lot of people of our generation have taken on roles as producers, and that they’ve actually been too hasty to distance themselves from the actual game development process. If you look at films or animation, people in their fifties or sixties remain very active. If we retire from actually making games, that spirit of craftsmanship won’t be handed down to the next generation. That’s why I think it’s better that we maintain a hands-on role in the game development process. Right, I really felt like I’d gone back to the coalface this time. By getting involved in the day-to-day creative process, I think that the determination and tenacity I possessed came into play and may well have changed the way the team worked together. 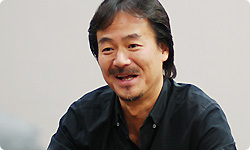 At the very least, if Sakaguchi-san hadn’t been the director, or if Takahashi-san had put distance between himself and the dev team, those titles would not have become the games they turned out to be. The younger team members really reaped the benefits from the determination and craftsmanship you both possess. In the Last Story presentation, Fujisaka-san9 spoke about the time he was working late at the office when Sakaguchi-san came in after a night out, gave instructions regarding the design of the logo, and then went home again. I was really able to picture that scene. Sakaguchi-san has always been like that, hasn’t he? (laughs) If he tells someone what to do, they have no choice but to get on with it. But I think that’s really important. 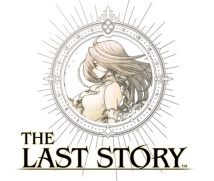 9Kimihiko Fujisaka was responsible for character design on The Last Story. I think that’s possible because there is such a deep trust in Sakaguchi-san. If you do something just because the boss has told you to, you won’t put your heart and soul into it. You need to have faith that the person giving you instructions has thought about things more deeply than you. Then, even if your opinions differ, in the end you’ll be happy to do what you can to help them achieve their vision. Do you think that you do that kind of thing unconsciously? But with the graphics, you’re quite open to other suggestions, aren’t you? Yes, I’d say so. I mean, I can’t draw, so if it was left to my imagination, I think the game world would be lacking and limited. The important thing is to have a vivid game world that’s full of life, and the best way to achieve that is to let the experts get on with creating that world. In the end, you were able to do that because you trusted the filter that Takahashi-san had. Yes, that’s right. It’s something I’ve always found curious, but there are those people who can draw and those who just can’t. Leaving aside individual abilities, even when they alter their approach, people who are really able to draw can still create really vibrant artwork. I’m not sure what explains this gap. Taka-chan, why do you think there’s this gap between people who can and can’t draw? I think it might be a question of imagination. At least in my own experience, it starts with the story Sakaguchi-san comes up with, and then you try to envisage what you should be aiming at, what you’re trying to create. You then make suggestions within that framework of what you perceive that Sakaguchi-san is aiming for. So you mean you come up with things you think would work well in the gameworld based on the hints given by Sakaguchi-san? Yes. If you can’t do that, you’ll end up coming up with something that differs from the game that was originally conceived. This is something I often say in my company, but it’s incredibly important that no matter what element you’re working on to be able to envisage what others are thinking and trying to achieve. I think you could call this empathy. Ah, I see. Empathy is a good way of putting it. If you don’t have that empathy with the end user, you won’t be able to create elements they’ll embrace. This empathy isn’t just something between developers and players. It also needs to exist between the core members of the dev team and the other staff. To put it another way, if you yourself cannot create your mindset of, “I want to achieve empathy!” right from the start, you’re in trouble. I get it... First, you need to have that empathy among your staff. Well, Taka-chan, you’ve really come up with some words of wisdom there! (laughs) If the team members are in sync, they can come up with a game world that surpasses the one I had envisaged. And that’s precisely why we should all join forces to aim as high as we possibly can. I think that’s true. Remember in the old days when we were doing debugging in our office, everyone would come in on the last day and play through the game. That was a lot of fun, wasn’t it? You’re right, that was great. We’d finish the job, have a beer, and we might even shed a few tears. Uematsu-san10 cried the most, didn’t he? (laughs) 10Nobuo Uematsu is a composer of music for games and was responsible for the score on The Last Story. He really cried a lot! (laughs) But the games made in those conditions never went far wrong, did they? That’s also an example of being in sync. If everyone has empathy for each other, you’ll end up with a real sense of unity. And that energy ends up transferred to the actual games themselves.